At Peppermint we like to think we have pretty good taste when it comes to default wallpapers, however it's certainly possible that your taste might not agree with ours. Should this be the case, the wallpaper is very easily changed. The first step is to simply right-click an unoccupied spot on the desktop. This will bring up a context menu containing a few options including "Change Desktop Background". Alternatively you may access "Wallpapers" from the "Accessories" section of the menu. From here you will see the option to change the wallpaper. 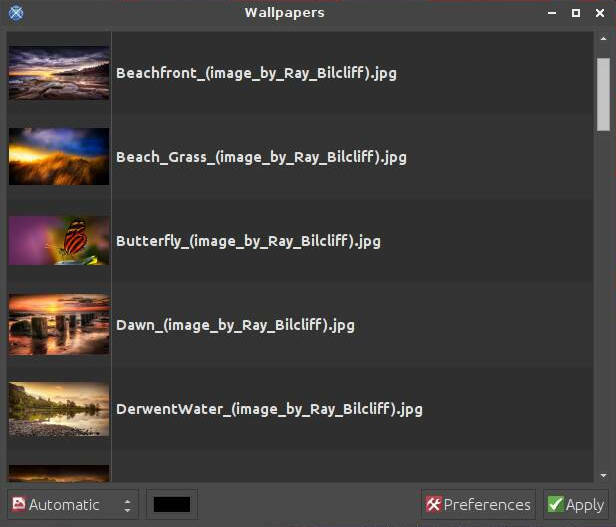 The Wallpapers application will display the default wallpapers which are stored in the /usr/share/peppermint/wallpapers directory, but the you can add any directory you wish to be scanned for images by clicking the "Preference" button then choosing "+Add" and browsing to the directory of your choice, any images contained in (or added to) that folder will then be available for selection in the "Wallpapers" application. Another method for setting the desktop wallpaper is to right-click on any image file on your PC and select "Set as Wallpaper..."
Peppermint makes use of a nifty little application called "lxappearance". Since the name of this application leaves a bit to be desired, the application developers have chosen to have it called "Customize Look and Feel" so that everyone can have a more clear understanding of exactly what it does. As you can see, this application contains most of the functionality necessary to make the desktop look pretty much any way you like. There are a couple of things that may seem every so slightly out of place, for instance the system-wide default font is on the "Widget" tab rather than on the "Font" tab. You'll notice that within "Customize Look and Feel" there are functions to install downloaded themes for all sections except "Widget", which we'll cover below. 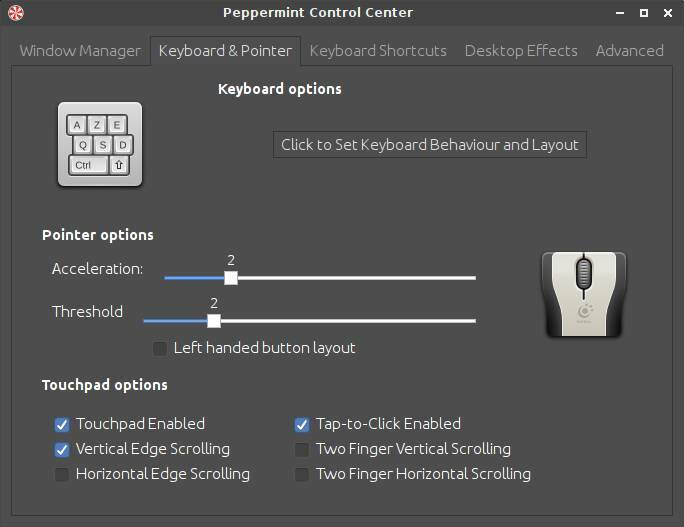 Peppermint now contains a configuration application called the "Peppermint Control Center" which is located in the "Preferences" section of the main menu or in the new Peppermint settings Panel. The addition of the Xfwm4 window manager in Peppermint Four introduced some disjointed configuration options that were not intuitive and added a degree of confusion to the system. 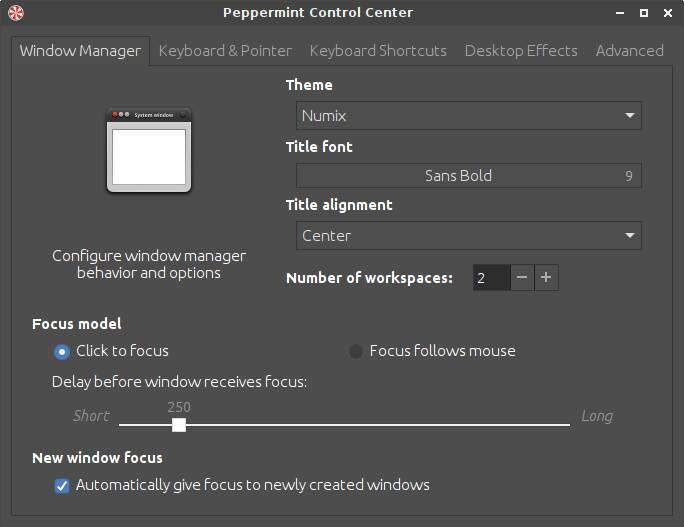 We wrote the Peppermint Control Center to fix this and to consolidate the features of several other applications into a single, unified window. 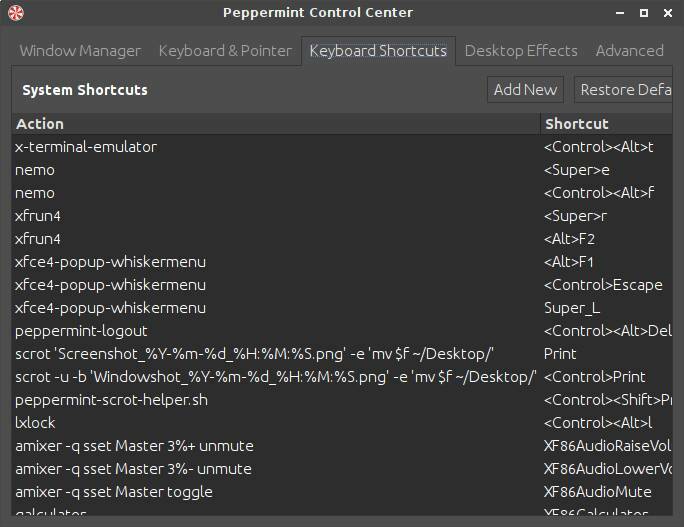 As you'll certainly notice, the Peppermint Control Center has configuration options for the window manager, the keyboard and pointer, keyboard shortcuts, desktop effects, and more. Changes made within the main Control Center window are applied immediately. Changes made in the "Select Keyboard Layout" window instead require clicking the "Apply" button before any changes are applied. At this point the Control Center has limited support for configuring keyboard shortcuts. This support will be consistently improving as time goes on and updates to the application will reflect these changes. If you would like to report bugs, request assistance, or discuss potential improvements to the Control Center, please visit us on our official forum. 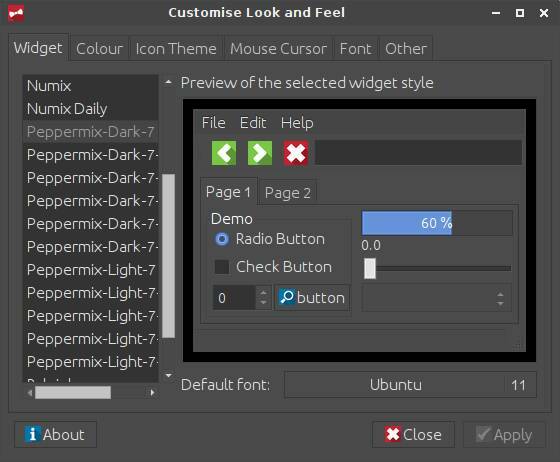 The section label as "Widget" in the "Customize Look and Feel" application really refers to what are technically known as "GTK Themes". GTK, short for "Gimp Tool Kit", is a widget rendering toolkit commonly in use by a number of open source desktops including LXDE, Cinnamon, Gnome and Xfce. 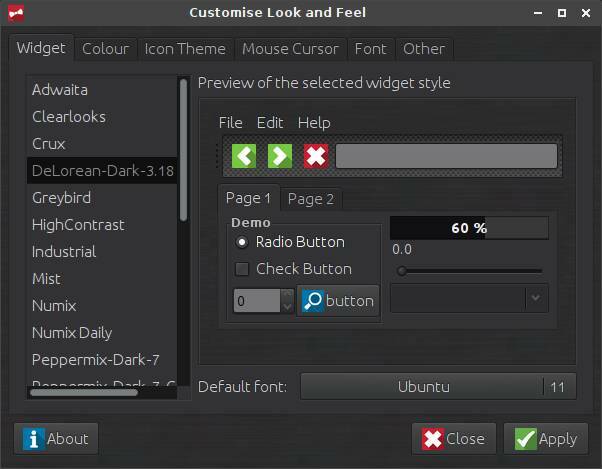 Although "Customize Look and Feel" does not currently offer a simple graphical method to install GTK themes, this can still be done quite easily with just a couple of steps. 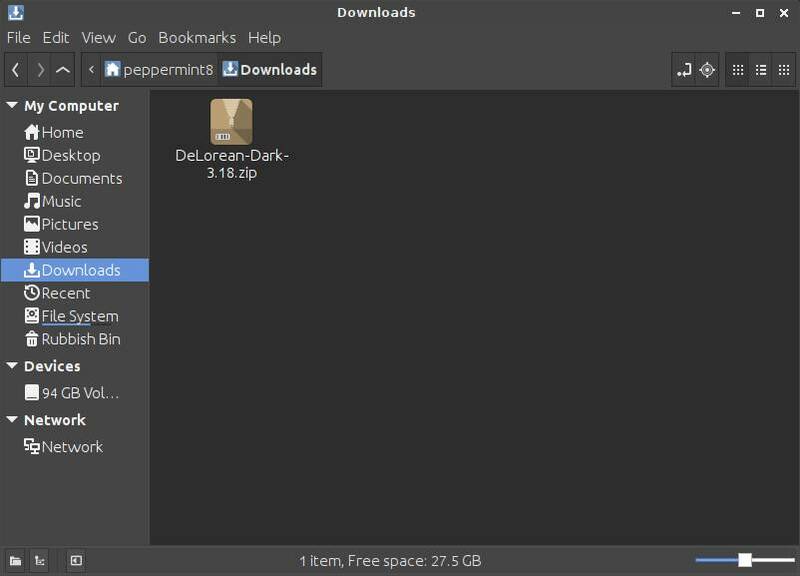 In this example, I'm going to use a theme called "DeLorean-Dark-3.18" that is available from gnome-look.org. 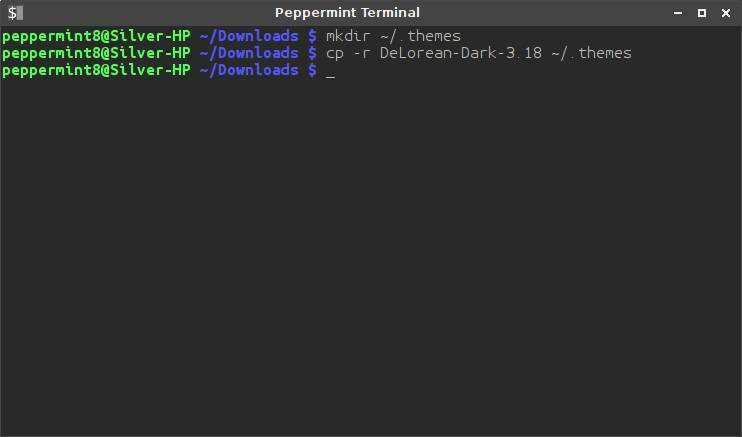 The default application selection in Peppermint necessitates that in order for everything to look proper, any theme you install must have both a GTK 2.x component and a GTK 3.x component, so it may be in your best interest to check for these prior to installing themes. Typically most themes labeled as "GTK 3.x" will include a GTK 2.x component, but there are certainly exceptions. After downloading the theme, it should be present in your "Downloads" directory in the file manager. From here we can double-click the .zip (or .tar.gz) archive which will open the "Archive Manager" application. Simply opt to extract the contents in the current directory and we should be left with the original archive and a couple of directories. The first part of this command is "mkdir" which is basically an abbreviation for "make directory". You can use this command to create directories anywhere in the filesystem presuming you have the proper permissions to do so. In this instance we're creating a directory called ".themes" in your home directory. There are a couple of things here that need some additional explaining though: In all terminal instances the characters "~/" represent your home folder, and the period (or dot) in ".themes" indicates that this is a hidden directory. GTK is programmed to look for themes in the "~/.themes" directory so adding any GTK themes here will make them immediately available. Once you've created the "~/.themes" directory you will not have to do it again for additional themes you wish to install. In this command we make use of "cp" which is basically an abbreviation for "copy". The "cp" command is rather simple in that you type it, tell it any specifics about how to perform the operation, choose what you want to copy, and finally tell it where you want to copy it to. In this case the "-r" means to recursively copy something, which is basically a glorified way of saying that in addition to copying our target we want to copy absolutely everything inside our target as well. Next we see "Delorean-Dark-3.18", which is the name of what we want to copy. Finally we see "~/.themes/", which is the location where we want the theme to end up. If any of this seems a bit abstract, don't worry. 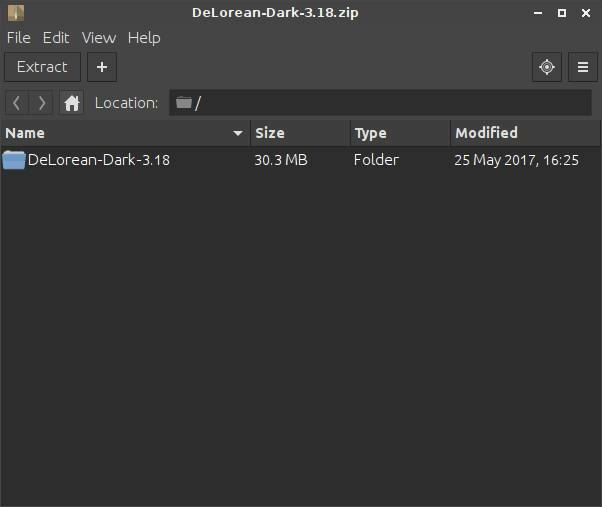 Just know that if you wish to do this with additional themes, just replace "Delorean-Dark-3.18" with whatever the name of the folder is that results from extracting the archive. Congratulations! The theme is now installed. If you open the "Customize Look and Feel" application you'll see that the theme is ready to be used. The default Panel in Peppermint can also be customized to your liking. The location, appearance, and layout of the panel are all easily customized by simply right-clicking anywhere on the panel and selecting "Panel > Panel Preferences". The panel supports multiple positions on screen including either side of the screen. Be warned that this does not always look the best though. You can even specify the width of the panel or set margins on either side in order to place it precisely where you want it. When it comes to appearance, the panel gives you several options. By default Peppermint uses a single panel at the bottom of screen, but you can add more including 'dock bar' style panels. You may wish to experiment with some some of the settings in here and fine tune it to your own liking. A word of advice though, as there are millions of setting permutations it may be safest to change just one or two things at a time remembering their default settings in case you want to switch back .. if you somehow manage to make a complete mess of things, please ask at the Peppermint forum how to reset the panel back to defaults. In addition to all of this, you'll also find the panel "Items" tab which allows you to take any number of available applets and place them anywhere on the panel you like. Examples are a application launchers, a directory menu, and a 'show desktop' button which allows you to quickly minimize all open application windows and access the desktop, then return them to their previous state. If the applet you're looking for isn't already available more applets can be installed via the Synaptic package manager.